China’s engagement with Africa appears to be causing headaches in Washington. After two decades of neglect, American interest in the African continent has been renewed by an announcement about the Trump Administration’s new Africa strategy delivered by the National Security Advisor, John Bolton, at the Heritage Foundation. 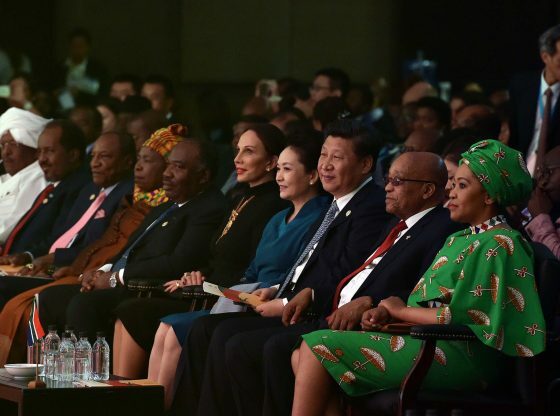 The announcement took aim at China’s initiatives on the African continent and, to a lesser extent, Russia’s, accusing Beijing of using ‘bribes and corruption’ to gain an upper hand in its relationship with the states of Africa. This comes at a time when American foreign policy has become defined by its opposition to China and Russia, with Washington labelling them as ‘revisionist powers’. Bolton’s announcement not only highlighted some common problems with established readings of China’s Africa policies, which often overlook how Beijing has been able to cement its influence across the continent, but also underlined common flaws in Washington’s response to China, which are the result of such an interpretation of Chinese initiatives. References to bribery and corruption can be seen as a reflection of these common and simplistic readings of China’s Africa policies, which have often been depicted as doing little more than showering corrupt nations with Chinese money. While Chinese investment has frequently been characterised as lacking transparency, in many cases China has been one of the main sources of investment in the face of an apparent lack of will by other external actors to provide similar levels of investment. This in turn has further cemented China’s centrality to the continent’s development. In addition, these investment initiatives indicate how Beijing has been willing to take greater risks in the African states, which has enabled China to gain a near monopoly in troubled yet resource-rich countries such as Sudan. This can also be seen in China’s numerous infrastructure projects throughout the continent. While these have frequently been characterised as debt traps, the initiatives are often the only means for African states to acquire economically valuable infrastructure, with further debt distress being the price they have to pay. Another flaw in the approach outlined by Bolton is that it largely overlooks how Beijing has managed to make its gains in Africa, which goes beyond simply bribing African elites. For nearly two decades China has been carefully courting the African elites and population through its soft-power initiatives and Beijing’s close relationships with those elites. This has cemented the relationship between China and many African states such as Zimbabwe, for example, where Chinese ideological assistance to the country during the Rhodesian Bush War played a notable role in furthering China’s post-Cold War engagement with that country. While Chinese engagement has not been without controversy in several African states – the most notable example being competition between Chinese and local firms in Zambia – there has been some local support for these projects, thanks in part to China’s popularity as a study destination for overseas students from the Anglophone nations on the continent. It is these aspects that have been integral to China’s approach throughout the developing world. In contrast, while Bolton’s announcement cited the importance of Africa to US foreign policy, Washington’s approach to the continent, along with that of the European nations since the end of the Cold War, has largely been characterised by indifference. This was most recently highlighted by Kenyan president, Uhuru Kenyatta’s, rebuke to the British Prime Minister, Teresa May, that it had taken over thirty years for a British leader to visit Kenya. Washington’s approach is also hindered by Trump’s derogatory comments regarding the developing world, which only serve to underline the apparent indifference shown to Africa by the Western world. This indifference created the vacuum in Africa that Beijing was able to fill in the post-Cold War era, enabling China to cement its foothold on the continent ever since. As a result, Washington risks losing its sway over the African states, a concern most recently expressed in a Bloomberg editorial, in which the South African political scientist, Robert Schrire, claims that ‘there is no way that America can really compete with China’. Possibly the greatest limitation to Washington’s proposed Africa strategy is its lack of clarity. While Bolton’s declaration was heavy with condemnation of Chinese initiatives, it offered few detailed alternatives to these projects. This will undermine any further attempts by the Trump Administration to impose a binary choice of trade with either China or the US. This is a choice that many nations are already unwilling to make, let alone states where China has become integral to their development. Such nations are unlikely to forego Chinese initiatives in favour of an ill-defined promise by Washington, which further highlights the problems with America’s bid to counter China’s rise in Africa. While Bolton’s declaration represents a clear expression of Washington’s desire to challenge Chinese moves in Africa, it does not clearly demonstrate how the Trump Administration’s Africa strategy will effectively compete with China’s more established initiatives, making an already difficult task even more challenging. In addition, the American strategy appears to be based on a flawed reading of China’s Africa policies that overlooks how China was able to make its gains on the continent in the first place. This means that any response based on this reading will also be flawed. If Washington is serious about challenging China in the states of Africa, then there needs to be greater clarity about what the US seeks to achieve in those states as well as in how it reads China’s foreign policy in the region. *Tom Harper is a doctoral researcher at the University of Surrey specialising in China’s relations with the developing world. Image Credit: CC and Flickr/ Government ZA.